Gorgeous lily bouquet David picked for me. Sylvester always wants to play with Duchess. It's the sweetest thing. Been drinking so much of this lately! Go here for the recipe. Sweet sentiment drawn by David on the concrete before installing our new floors (more on that to come!). Our black-eyed Susans are blooming like crazy! Gizmo is into everything lately. I forgot how curious and crazy kittens are. We watched my grandma's dog while she was on vacation. Roxy quickly worked her way into our hearts! loved the pups and cats. and RAIN! looks so refreshing! need some here. Oh I love the dog and cat love picture! ! Yes! I've been drinking too many lately too! :) yum! Great pics Tammy and such a darling pup! Wonderful images; thanks for sharing a simple way of living! Love the pictures Tammy! Awww..Gizmo is just adorable and it's so sweet with Sylvester and Duchess! Nice photos, especially of the black eyed susans. And I always love animal shots. Your kitten is adorable. Aww, those kitties are getting so big! Beautiful pictures! I love the shot of the rain - we could use some! Your kittens are too cute :) All your photos are beautiful! Tammy, I love the cute doggies and the kittens. And the black-eyed susans are beautiful. Lovely images, have a happy week ahead! I love them all! Such a great idea to clear the camera! I love clear the camera posts. Random smiles. I can't wait to see those floors!!! Loved all of the pics! Your grandma sure has a cute dog! Beautiful photos, Tammy. I so love that sweet photo of Duchness and Sylvester. 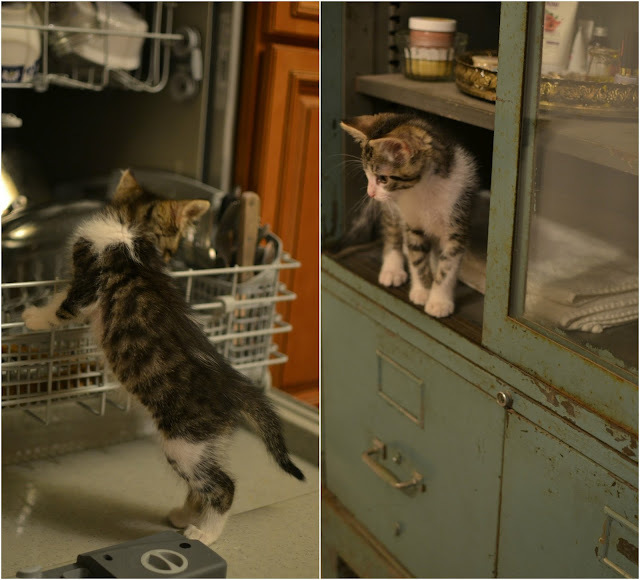 Great shots, the kitten looks like trouble in the making. Enjoy them. All of the pictures are so pretty but I especially like the ones of the flowers and the kittens!! All beautiful photo's! Loved seeing some more Gizmo :) I forgot how fast they grow! I LOVE the picture of your husband and Roxy. How sweet. Great set of pics. Gizmo is so cute! Gizmo is so adorable! And that rain picture is amazing! How did you capture that? I can never hardly capture the raindrops on camera. For some reason they never show up well. The picture of Sylvester and Duchess is smile-inducing. Sylvester and Duchess - PRECIOUS!! And good job to David on the bouquet gift to you - beautiful flowers! Yes....to the iced coffee. :) LOVE Gizmo - I do remember those trying kitten days. They are so sweet though, it makes you forget the craziness. Beautiful photos. yes, i loved seeing your slice of life. it's just perfect! Looks like a pretty nice life. I love the shot of the rain. We don't get rain like that in San Diego. The lilies & black eyed susans - those are both of my favorites this time of year. Little Gizmo is too cute, and I love the cabinet he is exploring in! We haven't had a rainy day in much too long now.. I've been craving one. Aw looks like you guys had a great week! I love seeing photos of your kitten. Make sure you take a ton while he's still so little! It's always my biggest regret when babies grow up. Your photos are so beautiful! You have such a great eye! Lovely flower shots!! The best is Sylvester and Duchess--- LOVE :-}} Like your heart too! Such sweet photos Tammy. I sure like it when you clean out the ole camera and always enjoy the peak into your hood :) Life IS good! Oh my gosh!!! I know that's not very eloquent of me, but oh my gosh!! These photos are extraordinary!! Black Eyed Susans are some of my favorite flowers too! I love the picture of Duchess and Sylvester! Oh, what a lovely series of shots. Love that last one! Tammy, love the shot of Duchess... our cats love to play with our Lucy. The kitten into everything, yup, I agree, you really have to watch so you don't close them up in something! Thanks for sharing on RBH this week! Amazing photos, as always. So glad you share them and CONGRATS on your etsy shop! Horray!! !